3 cultured pearls as eggs. Diamond bird's eye. 14K yellow gold pin. We will not send a combined invoice unless it is requested. We are not able to make any exceptions to this policy. 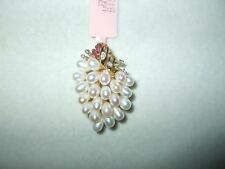 Pearls are 2.8mm and pin has the maker's hallmark on the clasp. Gold is marked, shows normal wear of use, minor scuffs. Pin bar and catch work properly on all 3. Good overall condition. Gemstones: Natural seed pearls (total 27). Type of Jewelry: 3pc Bar pin set. It has a neat clover shape typical of Victorian or Art Nouveau jewelry and it's covered in small seed pearls. Get Supersized Images & Free Image Hosting. 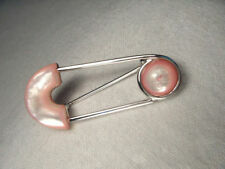 Vintage STERLING SILVER Genuine PEARL Chevron Cable Tack Pin - GORGEOUS, L@@K! It is hallmarkedSILVER & jeweler tested as sterling silver. Condition is Pre-owned. From a family estate. Beautiful brooch. Floral spray. Asian inspired design. S tamped 14K. C lasp works well. Other than a quick wipe down of the item or box we do not want to risk altering the item. Lapel pin in 14K yellow gold. The pin is a butterfly with seed pearls. The butterfly has 10 oriental seed pearls in the wings. 2 seed pearls in the body. The 14K butterfly without the back weighs 1 gram. This is a nice little pin. Wrath design with gold leaves. The pins all appear to be 10K gold. One is stamped, but the others are not. The coloring is identical on all. I don't believe the heads are gold. It appears that the owner collected pins accented with seed pearls. THIS IS A WONDERFUL BROOCH / PIN SET WITH 8mm SILVER PEARLS IN STERLING SILVER LEAF MOUNTING. This beautiful brooch pin is very well made of solid and stamped 14k yellow gold. The design is modern yet classy. It is a bar style brooch, 2" long, with shiny, twisted solid gold ribbon and freshwater baroque (irregular form) pearls set on solid gold wires. Weight 4.10 Diamond 2.46 cts. In great shape. pearls are from tokyo, japan. well made and all original. has orig label in box. PRE-OWNED IN OVERALL GOOD READY TO WEAR CONDITION. WEIGHS 3.4 GRAMS. Weight - 3.5 dwt / 5.3 grams. Approximate carat total weight of all colored and non diamond stones. Condition issues other than ordinary and normal use marks. Approximate color of diamonds (this will be the average on clusters). Inventory Number. 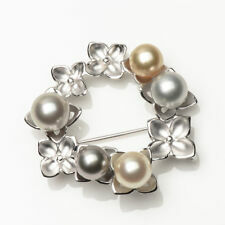 Mikimoto Sterling Silver Flower Pin / Brooch. of Mikimoto Pearls.so nothing more needs to be said. set with 18 White Akoya Cultured Pearls. 12 Pearls = 5.5 mm each. 6 Pearls = 4 mm. and relist it at it's higher fair market value. •A classic unique 14k yellow gold genuine pearl and ruby pin brooch. Make Supersized Seem Small. Get Images that. Total weight is 9.6 grams. There is no makers mark that i can see. Coins, Bars, Notes & Bullion. Akoya Pearl -. Belt Buckles. SEP Sapphire. Flatware and Silver. Closure Type: Hinged Pin and Whale Tail Bullet Clasp. JUN Pearl & Alexandrite. APR Diamond. Gorgeous on Lapel or Black Dress. GIA graduate. 3rd generation. Wh ol es al e pr ic ed. Beautiful and whimsical. Sterling Silver Brooch, Pendant. Spider With big blister pearl. One of a kind piece handmade in Bali. Conversation piece for sure. Clasp is secure. Hallmark: Marked 10K. 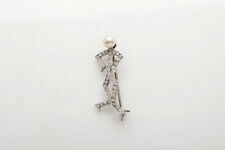 Beautiful antique sterling mikimoto akoya pearl leaf motife broach. Very well made from Japan. Detailed six pearl design. Antique 14K Solid Gold Turquoise & Seed Pearl Pin Brooch Vintage Estate 2.3"
Natural turquoise and seed pearl. Very well made. Great condition for age! Wonderful piece here! Very old, not sure exact date. Solid 14K gold. No hallmarks, thoroughly tested to be solid 14k. 18KT GOLD ORCHID PIN WITH PEARL IN THE CENTRAL PORTION. BOTH DELICATE AND ELEGANT, CLASSY YET NOT PRETENTIOUS. 2 1/8 TALL BY . WIDE 1 1/ 7 GRAMS. (Set With Cultured Pearl and Diamond. Set With 11 Cultured Pearls. 1 5/8" x 1 7/8").26 Total Diamond Carat Weight. Can Be Worn With Pinback or on Chain. 14 K Solid Yellow Gold Pin Or Brooch With Pearls. 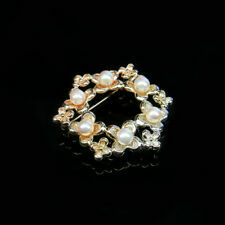 18 K Solid Gold Flower And Pearl Pin Or Brooch. 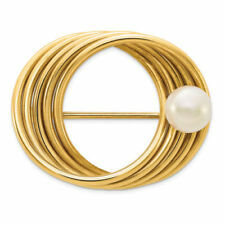 This 14K yellow gold pin has 10 lustrous, beautiful pearls. The "ribbon" of gold is nicely engraved. The pin is signed "K14.". This exquisite pin is in excellent condition. Genuine Akoya Pearl Pin. Genuine Akoya Pearls. Pin is 1 7/8" x 1". if you change your mind or do not like the item. you do not see what you want. This is a unique 14K Solid Yellow Gold Pearl Brooch/Broach with. 06 Carat Round Brilliant Diamond, I1 clarity and M color with 11mm Pearl. It has been gently worn, is in excellent condition and stamped 14K. On the back of the brooch the hallmark stamping of "750". The back also features a 1.5" hinged pin with locking clasp. 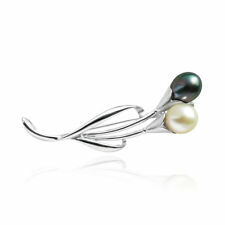 The flowers have stems that are high polished, while the leaf has a matte finish with a 5mm freshwater cultured pearl. 14k Yellow Gold Pin With Pearls. 4.3g total 32mm tall 28mm wide Please message with any questions or for additional photographs. 1.14ctw Total Gemstone Weight 14K White Solid Gold Brooch. 14K Solid White Gold. 2 Round White 8.0mm Cultured Freshwater Pearls. CLUSTER OF PEARLS (9). CAN BE WORN ON A NECKLACE AS A PENDANT OR AS A PIN. ESTATE PIN/BROOCH OR PENDANT. MARKED 14K. Three white pearls (probably natural) are suspended from a gold festooned chain. The original C clasp is hallmarked GV & Co and 9ct. 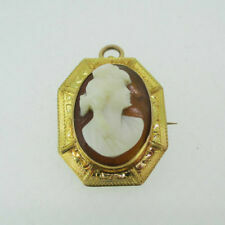 It is a beautiful, wearable piece of antique Art Nouveau jewelry which is getting so hard to find. Up for sale is this gorgeous Authentic Mikimoto Estate Pearl Brooch/Pin w/ Box.This brooch is very well made and sits comfortably and straight when worn. It has a very secure roll-over clasp and is clearly stamped with Mikimoto's trademark makers mark. Authentic Mikimoto 14K Solid Yellow Gold Pearl Flower Bouquet Pin Brooch 1 3/4"
LADIES 14K YELLOW GOLD 6mm ROUND PEARL SWIRL FLOWER JUNE FINE PIN BROOCH 1.18"